I just steamed the cake this morning and I am issuing the post today, which is rather unusual. I usually have the picture taking after at least 8-10 hours of resting. However, I have decided to post it today because some members of a Facebook Group is requesting for the recipe to try out (possibly for their Valentine’s day tomorrow)..
it is a simple cake to prepare though it looked a bit complicated. 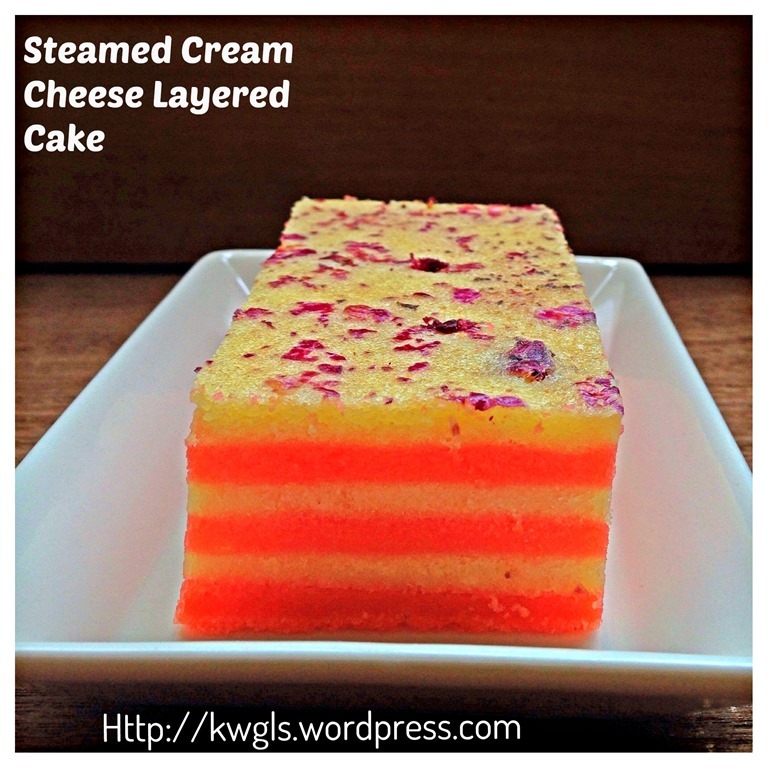 It is a nice and moist cake since it is steamed. 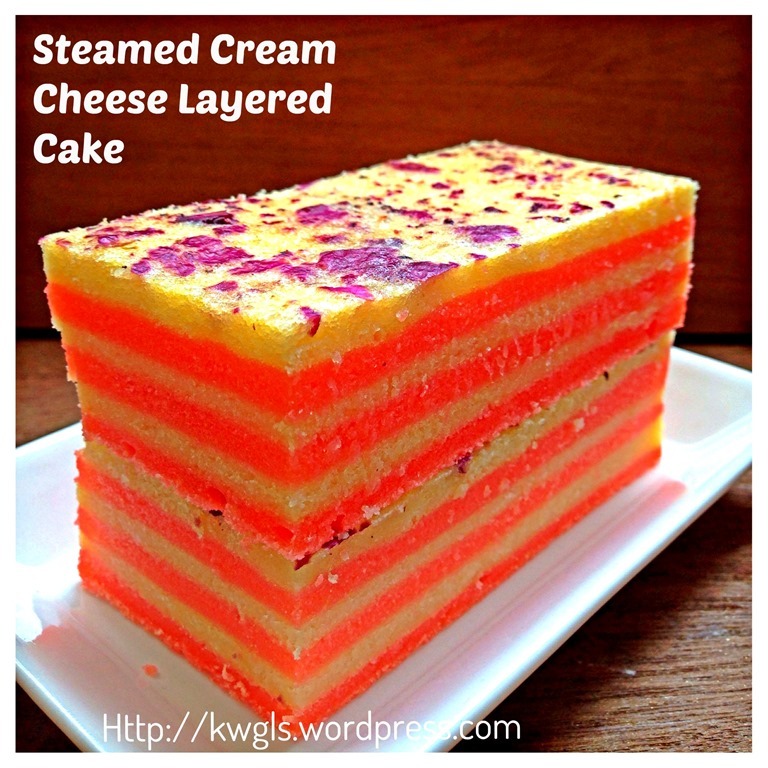 I can tell you very frankly, I like this steamed version of layered cake when compared to the baked version of layered cake. 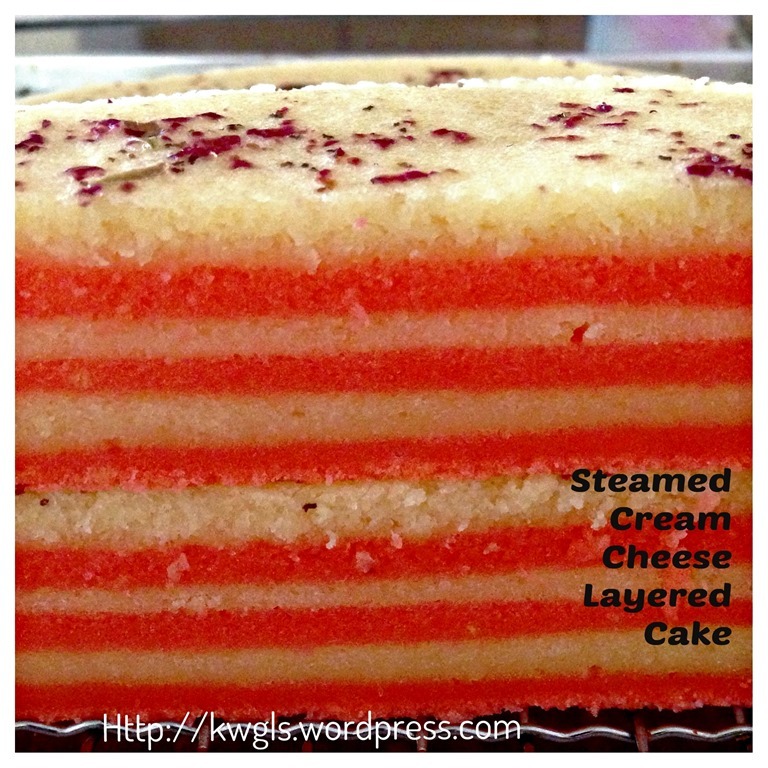 For baked version of layered cake, it was long hours of baking in an oven causing the cake lost in moisture. In general, what make an oven cake “moist” and fluffy in effect is the butter content in the cake, the higher it is, the “moister” it is.. This is not a new recipe at all, it is the modified, steamed version of my Chocolate Cream Cheese Lapis Cake earlier. 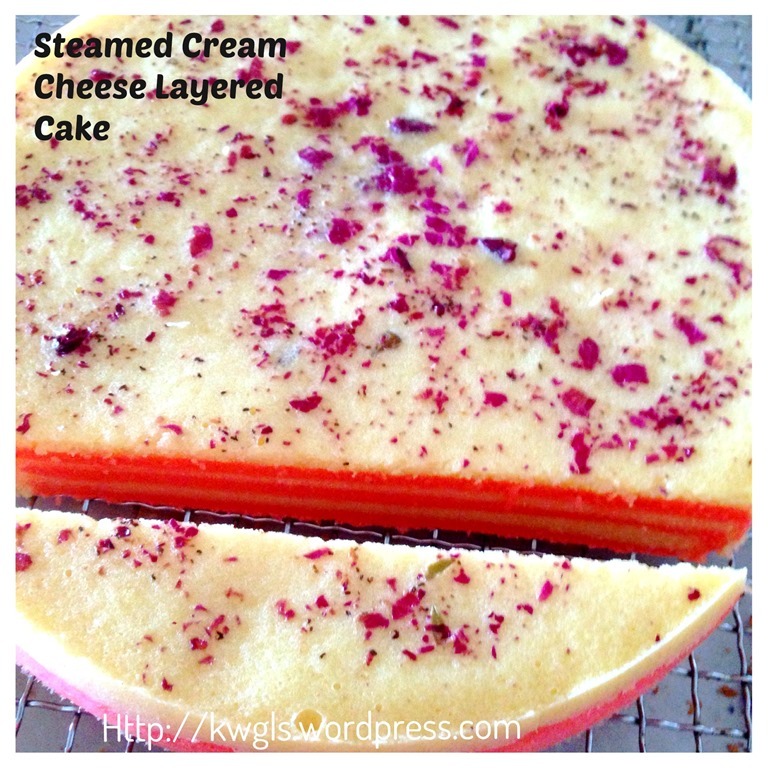 I have always wanted to try the steamed version of baked cakes.. 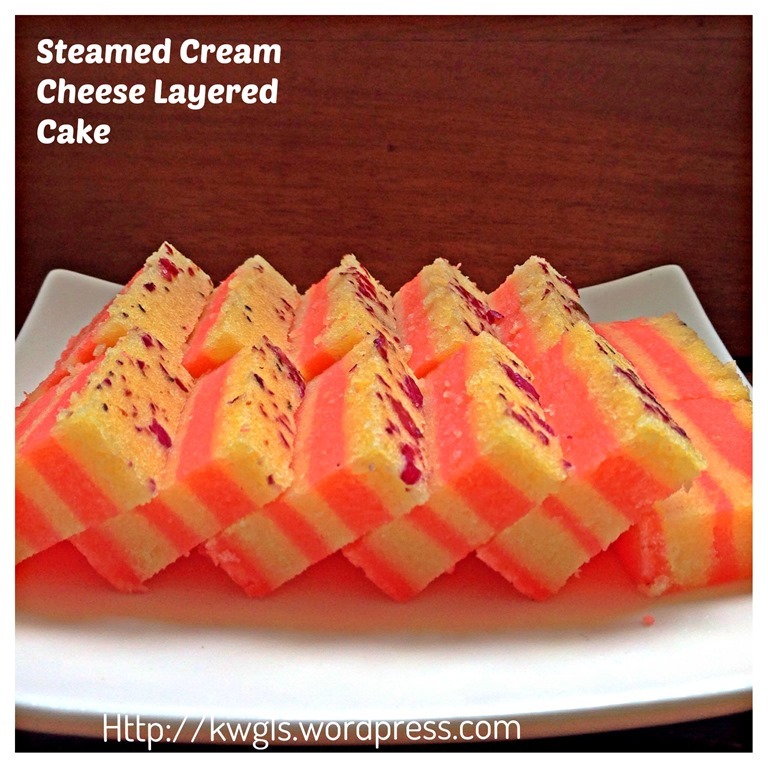 Being born and raised in Malaysia, I have been exposed to Malay steamed cakes.. Most traditional cakes are steamed as majority of the families do not have the oven until rather recently. 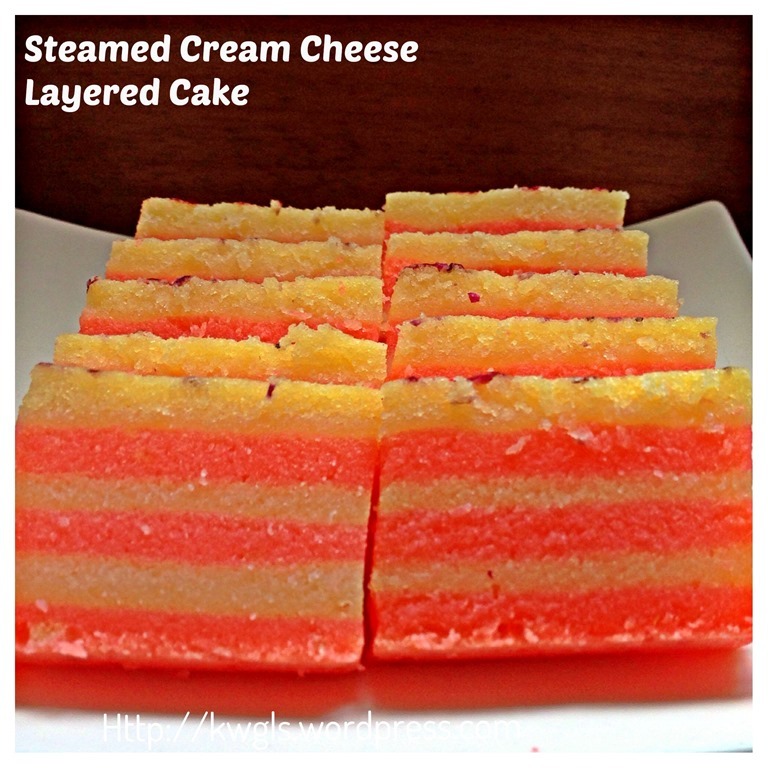 I like the Malay version of steamed cakes because it is very moist.. 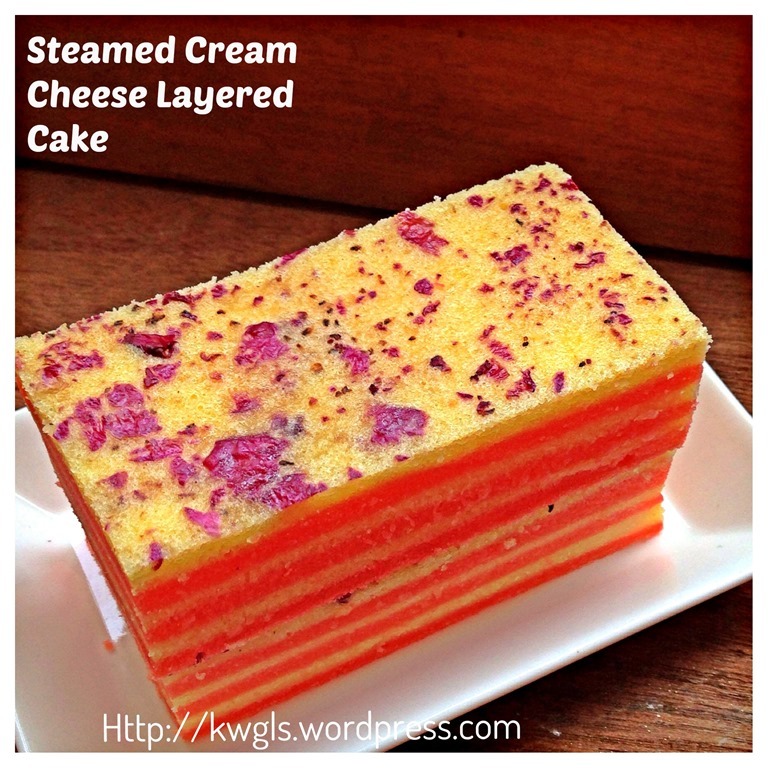 Unlike traditional Chinese steamed cakes like sponge cake (kuey neng ko) and huat kueh which is rather dry as there were no fats (oils) used, Malay steamed cakes, on the other hand usually are rich with butter and eggs, so it is moist and a sinful indulgence. For my photo taking purposes, I need to use some colour to show the effect. However, if you are not fancy of food colouring, just omit it, Instead of putting colouring in one portion of the batter, you can always use cocoa powder or coffee paste.. Colouring is totally optional, For the topping, I have sprinkled some edible rose petals. That is optional too… It is purely for decoration and it wouldn’t seriously affect the taste. As I was preparing in a rush, I have made a mistake of using an 10 inches diameter round baking tin. Making it slightly thinner. However, if you used an 8 inches diameter round baking tin, it should have 2-3 layers more. How does it taste like? 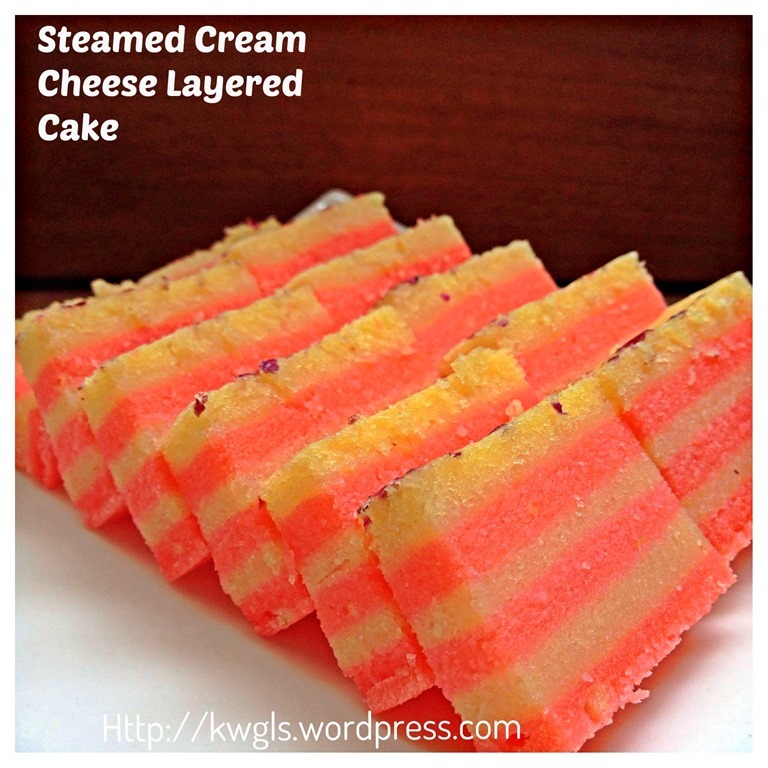 It tastes like a moist but dense butter cake with cheesy flavour.. If you use cocoa powder or coffee paste, it will become chocolate or coffee flavoured layered cake. 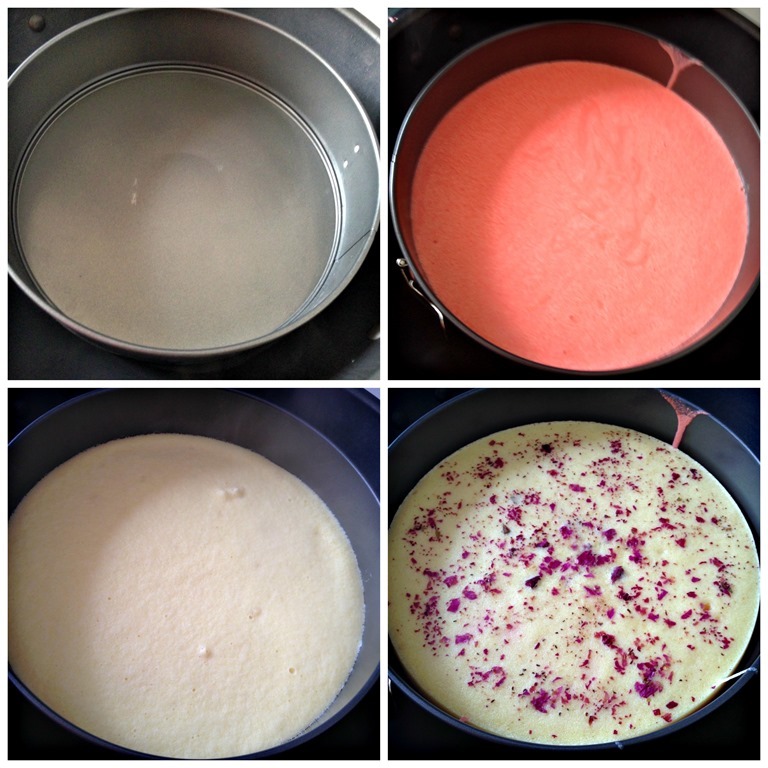 A lightly greased 8” diameter cake tin or any other types of baking cake tin . A steamer with adequate hot boiling water for steaming about 30 minutes. Cream the cream cheese, butter and sugar until light and pale. Add in vanilla essence, followed by one egg at a time and ensure that the egg and cream cheese mixture are well mixed. Take out the mixing bowl and fold in 1/3 of the flours followed by 1/3 of the milk.. Repeat for the other 2/3 portion. 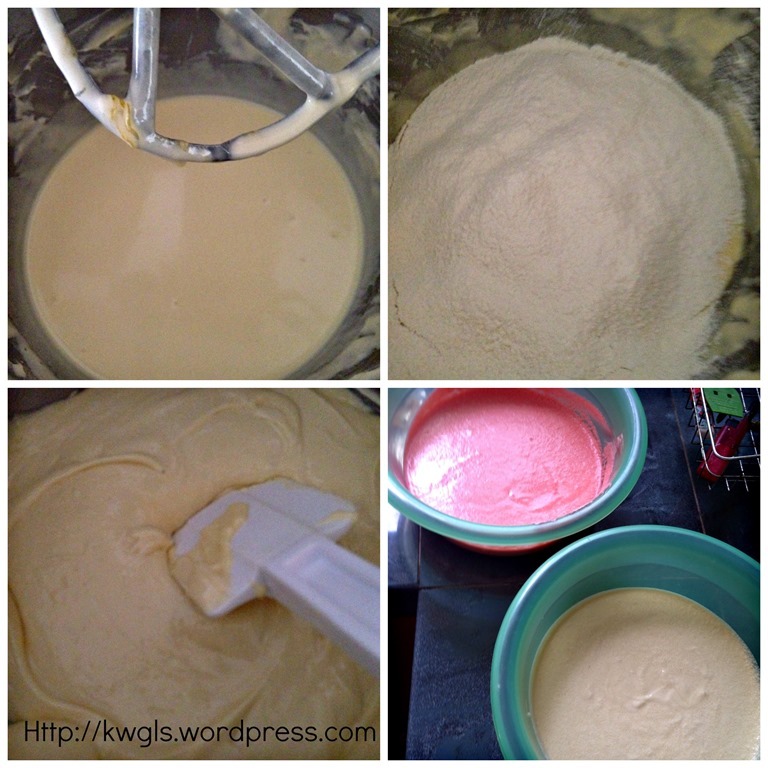 Divide the batter into 2 equal portions. For one portion, add in some permitted food colouring and stir until well mixed. Heat the greased baking tin for about 1 minute in the steamer. 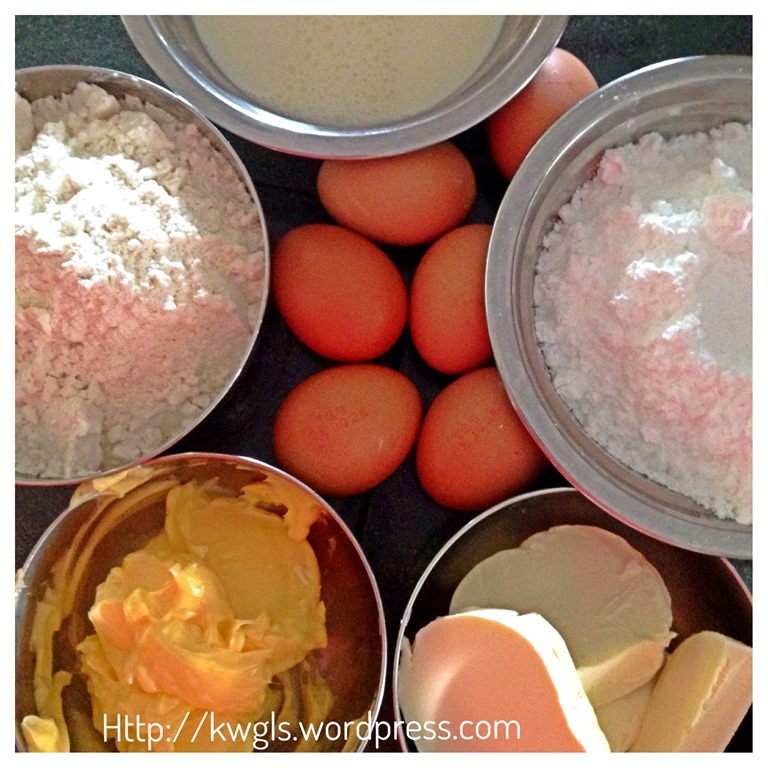 Put 2 ladles of red batter in the tin and ensure that it is equally distributed in the tin. Steam for 4-5 minutes or until the surface has dries up. If you note of some bubbling, use a toothpick to poke the hole and let the trapped air escape. Put another 2 ladles of beige batter, steam until dry. Repeat the same procedures until all the batters are finished. After all the batter have finished, for the last layer, you can sprinkled some edible rose petals if desired or create some pattern of your choice. Cooled completely before cutting into smaller pieces. Can keep in refrigerator for at least up to 2 weeks in an air tight container. If it turns hard, just re-steamed for a few minutes before serving. 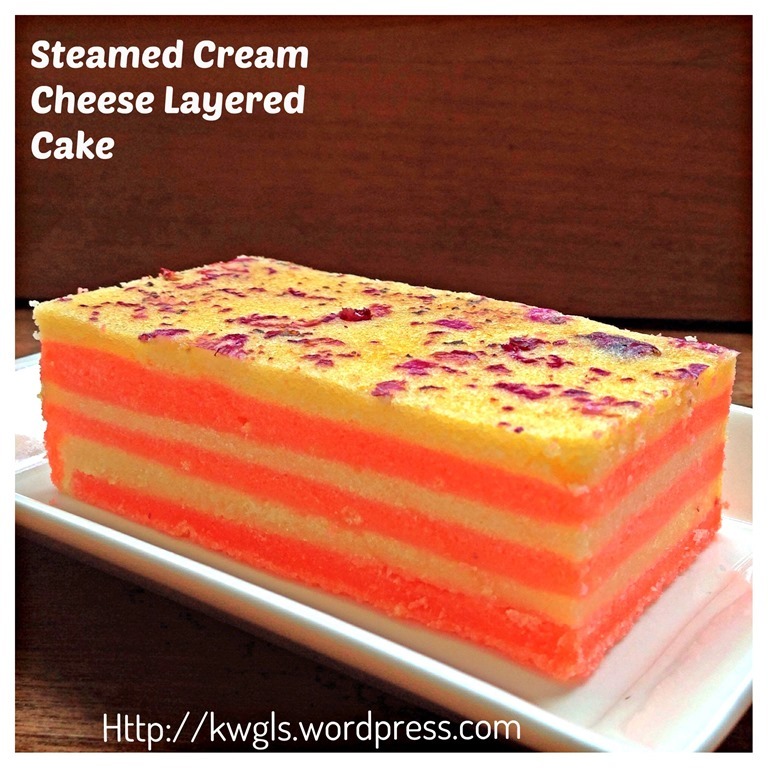 This entry was posted in Cakes and cookies, Chinese and Asian Cakes and Snacks, Food Preparation Series and tagged cream cheese, Cream Cheese Layered Cake, GUAI SHU SHU, Guaishushu, kenneth goh, lapis cake, postaday, Steamed cake, Steamed Cream Cheese Lapis, Steamed lapis. Bookmark the permalink. Can I please have a taste of this cake? I will take the next flight ! Sure. Please. See you then! If you come and none left, I prepared another one for you.. Yes yes I will visit and well worth the flight to taste your food and not just see it and ‘lau nuiah (is that the right expression? ..long time never speak like a pure hokkien). I have never had a cake like this before but it looks great! I love how created this is! It’s very pretty. 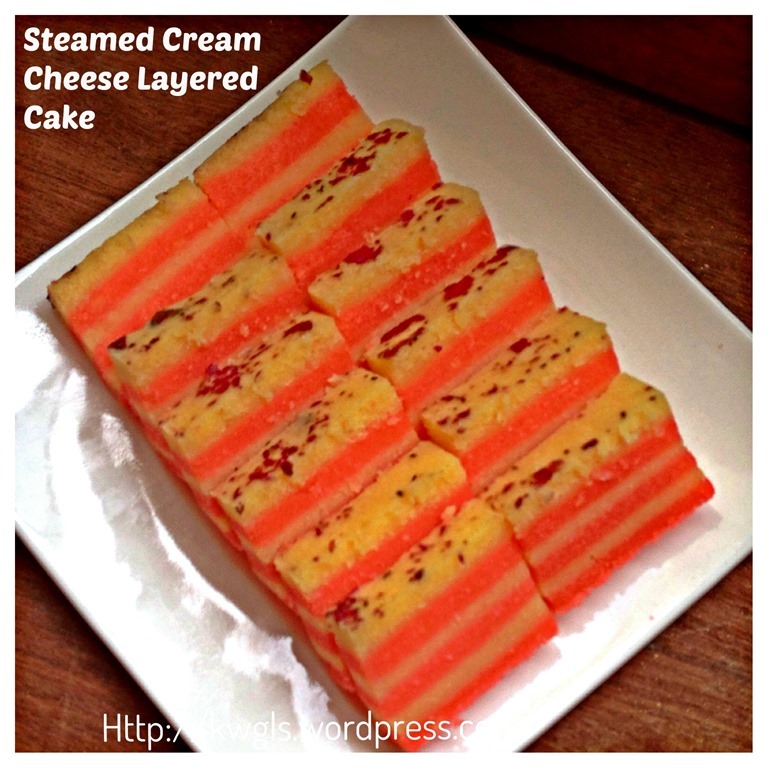 I’ve never heard of steamed cake before. 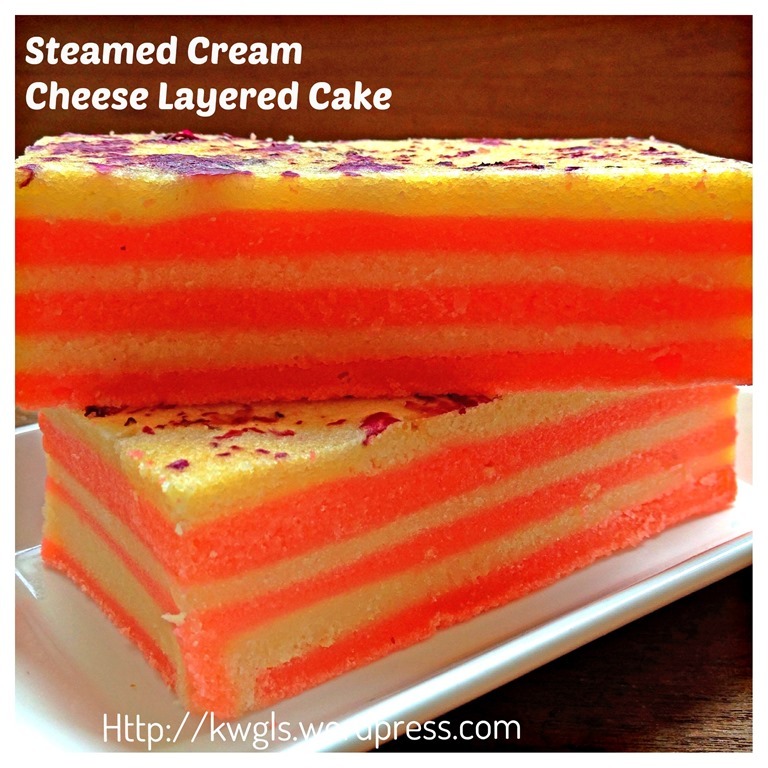 When I was in Asia I had a variety of steamed food but never a dessert. Thanks for sharing! G’day! Very creative indeed Kenneth! Your cake intrigued me and I would love to try it too! I chose your dessert snack as my fave at the Foodie Friends Friday Snack Foods Party this week! Thank you so much for choosing this cake as your dessert candidate. This was a good.recipe.except.that the center.of my cake was not.cooked. Tried re-steaming but seems unable to get it.right. The outer ring is good and.tastes.good.